Three thoughts on the on the Cubs' momentous NLCS Game 4 victory. Looking to clinch their first pennant since 1988, the Dodgers instead were stopped cold by the defending champions. Buoyed by a terrific start from Jake Arrieta and surviving a nerve-wracking final two innings, the Cubs avoided an NLCS sweep and took Game 4, 3–2, to force a fifth game of the series. Dodgers manager Dave Roberts was blunt about his team’s plan going into Game 4: “We’ll try to get to their bullpen and see what [Cubs manager] Joe [Maddon] does.” As far as strategies go, that’s a good one. Chicago’s relief corps has been a complete disaster in October, with a 6.35 ERA, 23 walks and six home runs allowed in 28 1/3 innings going into Wednesday night. With his starters unable to give him length and his middle relievers imploding nightly, Maddon has been unable to build a usable bridge to All-Star closer Wade Davis. The bullpen’s horror show is a big reason why the Cubs were in a 0–3 series hole, but the Dodgers weren’t able to expose that group’s soft underbelly in Game 4. Instead, they were stymied by a classic outing from Jake Arrieta, who looked like his 2015 Cy Young self in a stellar performance. Over 6 2/3 innings, the big righty allowed only one run and struck out nine, keeping the Dodgers off balance with a fastball that moved all over the plate and a hard curveball that sliced through the strike zone. He did leave his game in the hands of that dreaded bullpen, departing with two on, two out and a two-run lead in the seventh, but lefty specialist Brian Duensing got Cody Bellinger to pop out to end the threat. But that was far from the final Dodgers threat. Up 3–1 after seven, Maddon opted to stay away from the troublesome elements of his bullpen and instead asked for six outs from Davis, who had yet to pitch in the NLCS and had been forced to get seven grueling outs in the Division Series clincher. Things started terribly, as Justin Turner launched a booming home run to left to start the eighth and cut Chicago’s lead to one. The situation wasn’t improved by a horrible call by the umpires on a swinging third strike by Curtis Granderson that was inexplicably deemed a foul tip on review, prompting an irate Maddon to storm out of the dugout, expletives flying, and get tossed. Granderson struck out anyway, but it took Davis 34 pitches to get through the eighth after a pair of walks. In most situations, a manager wouldn’t ask for more from a pitcher after a long inning like that. But Maddon—or whoever was calling the shots after his ejection—stuck with his closer, even letting him bat with a runner on and no one out in the ninth. (He struck out, though he did foul off several pitches.) And for a heartbeat, it looked as if disaster loomed once Davis walked Chris Taylor with one out in the ninth and the duo of Bellinger and Turner waiting. But a hard groundball from Bellinger right to Javy Baez turned into a 4-6-3 double play that finished the Dodgers and kept the Cubs alive. 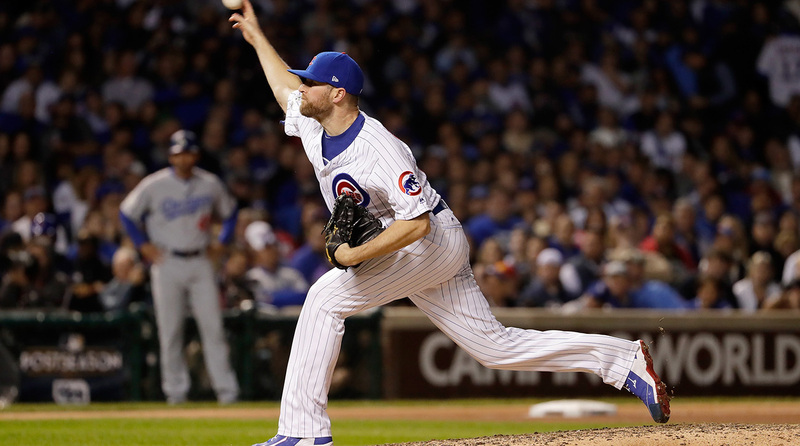 The cost to Chicago was enormous: Thanks to Maddon’s aggressive call, Davis had to throw 48 pitches and is almost certainly unavailable for Thursday’s do-or-die Game 5. But that’s the price the Cubs had to pay to avoid the sweep, and now they’ll hope that Jose Quintana can beat Clayton Kershaw and extend their title defense just a little bit longer. It wasn’t just the bullpen that had the Cubs one loss away from a long winter. An offense that destroyed all comers in 2016 and came alive after this year’s All-Star break has slumbered through the postseason, hitting its nadir in the NLCS. The numbers from before Game 4 are ugly: four runs on 15 hits with 32 strikeouts in 27 innings, including only seven hits in 44 at-bats (a .159 batting average) with runners in scoring position. The stars, meanwhile, haven’t been shining: Kris Bryant had struck out 13 times in 33 plate appearances; Anthony Rizzo was 1-for-20 since his go-ahead RBI bloop single in NLDS Game 3; and Baez didn’t have a hit on the month. Game 4 won’t make those numbers look much prettier—after all, the Cubs scored only three runs on five hits—but Chicago made its knocks count. Three of those five hits left the Friendly Confines, with Baez going deep twice (the first one producing an admirable stare and bat toss). It was Willson Contreras, though, who had the most majestic shot, as he took an Alex Wood fastball and blasted it 491 feet away off the massive scoreboard in leftfield in the second inning to open the scoring and give the Cubs a lead they wouldn’t lose. Those home runs were all the Cubs got; in fact, all seven of their runs this NLCS have come via the round-tripper. It’s hard to imagine a comeback being built off an offense that can’t string together rallies or put men on base ahead of those dingers. But the hope for Chicago has to be that Wednesday’s power display can get Contreras and Baez on track—and maybe provide some momentum for the rest of the lineup. The Dodgers have admirably survived the loss of Corey Seager, last season’s NL Rookie of the Year and one of the best shortstops in the game, who was declared out for the series due to a back injury. Most teams would have been crushed by his absence; Los Angeles, showing off its depth, shrugged and clobbered the Cubs in the first three games. It helps that Seager, even when available, didn’t look close to his MVP-caliber self: He hit .210/.286/.358 over the final month of the season as he fought through back pain, though he did contribute three hits and four walks in the Division Series against Arizona. But his unavailability forced Los Angeles to get creative with its bench and defensive alignments—most notably by pushing starting centerfielder Taylor (a former middle infielder) to shortstop and having to rely on the trio of Granderson, Enrique Hernandez and Joc Pederson in his stead in the outfield. That arrangement in center hasn’t worked. After striking out four times in four at-bats in Game 4, Granderson is now 1-for-19 in the postseason with 12 punchouts. Hernandez has a hit and a walk in six trips to the plate, but he’s best deployed as the right side of a platoon, not as a regular. And after a brutal season that included a mid-year demotion to Triple A, Pederson seems to have lost the confidence of Roberts: He’s gotten only five plate appearances all month. As far as problems go, this is a relatively minor one for a team that’s otherwise firing on all cylinders; as good as the Dodgers have looked, they can survive a blank space in the lineup. (That said, catcher and second base have also provided little, as the respective duos of Austin Barnes and Yasmani Grandal and Logan Forsythe and Chase Utley are coming up empty at the plate.) But after Granderson’s weak showing in Game 4, it’s probably time for Roberts to give Pederson—who doubled and scored in Game 3 and is far and away the best defender of the three—another chance.